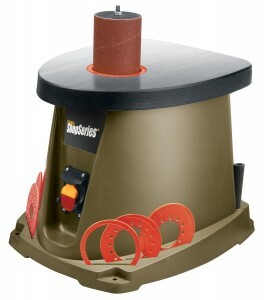 About six months ago or so I purchased a spindle sander, namely the Rockwell Shop Series RK9011 pictured here. I had never purchased a Rockwell tool before but the price was right and it had the features I was wanting plus I was able to get it at the big box store down the road from my house. I probably use this sander two to three times a week for shaping curved areas on grips or whatever I am working on at the time and overall I have been very happy with it. It’s powerful enough to use on very hard woods without it bogging down or being overtaxed and is small enough that it fits into my workspace perfectly. It even has a build in tool caddy for all the spindles and the wrench too! Unfortunately though, it decided to die on me. I was working on a set of revolver grips and had finished shaping the left side grips and was just beginning on the one for the right side when the sander went from it’s normal whirring sound to a grinding noise followed by smoke and the smell of wiring insulation burning. I contacted the company to see what the warranty would cover and, to be honest, was expecting to be told to take it somewhere to have it looked at after I faxed them a receipt to prove that I actually bought it on the fifth Sunday in a month with a blue moon. I work customer service for a company and have seen that kind of policy before – more about protecting the bottom line than taking care of the problem. Also, since it was a weekend I had to do it by email so to me that meant it would be days before I heard anything. I got a response from Rockwell on Monday simply asking what happened and the model and serial number of my sander, I sent a response and Tuesday my new sander was shipped out to me by FexEx. It arrived on Saturday and I am back in business. Like I said, I had never owned a Rockwell tool before, but with customer service like they have, it won’t be the last. So, I went shooting the other day with my dad. The original plan was to go with my brother too but since he is studying for his Lt. promotion board we ended up deciding to meet him at the range and he would just catch up. 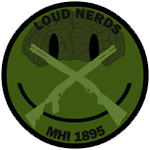 I brought the 1911 and the LCP figuring that since the LCP is new and I haven’t shot it that much I should get some more time with it and since dad reloads all his brass shooting the 1911 is relatively cheep especially when you are using wad cutters instead of FMJ or JHP. Things started off just fine. Had a new set of grips that I made out if Teak for the .45, two new 8 round magazines (don’t want to make the liberals scared of my excessive number of rounds), and a new magwell I was trying out. All was golden and glorious right up to the tenth round. Pulled the trigger and instead of BANG there was ‘click’. Now when it happened I will admit I first thought misfire so I waited a moment to make sure it wasn’t a slow burn, dropped the mag and ejected the round. What came out was a very dirty looking casing. The outside was black but otherwise it looked normal. I assumed (wrongly) that the ejector hadn’t grabbed it and tossed it out which, if I had been thinking, I would have realized if that was the case I would have been dealing with a mis-feed and the slide would have tried to grab a new round. I showed it to dad and he said something about the round not being crimped enough and needing to have a look at his reloading equipment when we got home and I went back to my lane not thinking anything more about it. It was when I put the magazine back in that I realized all was not right with the world. The round wouldn’t chamber. I STILL wasn’t thinking squib, and I should have since I have read about them plenty of times, instead I was thing ‘magazine not seated’ ‘bad magazine’ and even ‘bad round’ or ‘dirty feed ramp’. After trying a different magazine and checking the feed ramp I grabbed my dad who immediately called an end to range day and we headed home to see what was going wrong. Once we had it stripped there it was, jammed just far enough in the barrel so it couldn’t be seen but enough that another round would not load. 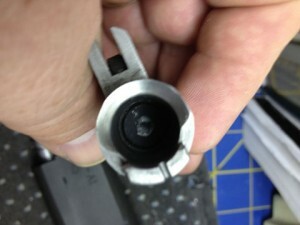 According to our gunsmith, he thinks the round didn’t get any powder and was all primer. Dad is going to have his reloading equipment checked by the manufacturer and the round was extracted from the barrel with no damage. Moral here, I guess, is never take anything for granted and pay attention to your ammo and your weapon. I should have realized all was not right when the ‘click’ happened. My initial thought of the cartridge not be ejected from the last shot couldn’t be right because the pistol wouldn’t have been cocked. I wasn’t expecting a squib and when it happened I didn’t follow the signs that were right in front of me. That’s when bad things happen – pay attention to the signs.